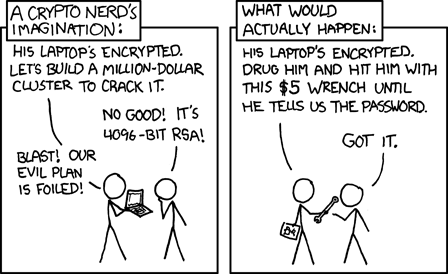 I’ll describe the problem I think that you have: You have data stored on computers which you don’t want the police or the governments to have, something that cryptography can not protect, as XKCD so eloquently puts in the cartoon Security below. You are not the only one: internet companies; financial institutions; churches; organizations working for freedom; lawyers; criminals and innocent individuals all need to protect themselves. It’s possible to use something like Darik’s Boot and Nuke (DBAN) which is a self-contained boot disk that securely wipes the hard disks of most computers, however this takes time sometimes a number of hours and requires human interaction. Time that may not be available if the long arm of the law comes down on you like a ton of bricks. And it can even be the case that the power is shut off before the computer is secured, the police do this to keep the data on the computer secured for the investigation. So I thought about what would be needed to magnetically erase the hard disk. Firstly I read that a hard disk should be degaussed, which is what decreasing or eliminating an unwanted magnetic field is called, with a electromagnet and not with a rare-earth magnet. Secondly I read that degaussing can cause permanent irreversible damage to hard drives which means they are not reusable. 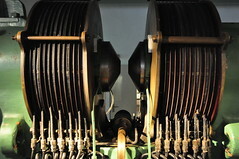 Unlike tapes the mechanism to read the magnetic track is part of the device and is also magnetic. So don’t expect to be able to use the disk after you have tested the electromagnet. Thirdly the magnetic induction (also referred to as magnetic flux density or saturation flux density) needed to correctly erase some hard disk can be from 6000 – 7000 gauss (0.6 – 0.7 tesla), an NSA approved degausser puts out 22000 gauss (2.2 telsa). From some sources I learned that mostly the core of electromagnets is made from a magnetic material – power ferrite – which has a magnetic flux density of under 4000 gauss, this wouldn’t be enough. A different material would be needed for the core of the electromagnet. I discovered that MPP (molypermalloy powder) material has a magnetic flux density of 7000 gauss, which is what is needed for this PoC. Iron powder and high-flux can yield 10000 and 15000 gauss respectively. Fourth you need thick copper wire wound round the core, this is called a solenoid. This creates the B-field which is the magnetic field which will erase the hard disk, using a gauss or EMF meter it is possible to measure the magnetic flux density in gauss or telsa produced by your electromagnet and experiment with getting the level to 6000-7000 gauss. Fifthly you need an Uninterruptible Power Supply (UPS), this will ensure that when the power is switched off that the electromagnet is powered up to erase the hard disk. Sadly this method will not work for solid state disks, although you can possibly attach squibs using a similar setup. That may be something for a future article.